My family and I spent a week at this beautiful condo. It's brand new and immaculately kept. Very safe and secure building. The team that welcomed us was extremely helpful and warm. The location is second-to-none. Just a 3 minute walk to 5th avenue with all the restaurants and action but far enough to be quiet. The beech is an easy walk away (and it's gorgeous!) Grocery stores and yummy local cheap eats also just a block or two away. The building itself has a gorgeous rooftop pool and everyone is very friendly and welcoming. Playa del Carmen is an amazing town. We've been going for years but this was by far the best place we've stayed at. Got the best of that resort feeling mixed with a local experience! wonderful penthouse, we had a lovely time. enjoyed the private rooftop area. used the running track nearby several times. I'd highly recommend this place. This is a beautiful condo and in the perfect location. It is a quick walk to all the action....restaurants, bars, shopping, etc., so you don't have to have a car. The beach is right there! We sat out on the deck in the mornings and had our coffee looking out at the ocean. Wonderful views. The kitchen has everything you need but the groceries. It is clean and well maintained. I would definitely stay there again and again and again! 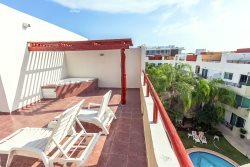 I have had the pleasure in staying here in Playa del Carmen in a brand new superbly equipped condo on Calle 38 and avenida 15 apt #1. It is a one bedroom with a king size bed that is very comfortable. The kitchen has all the bells and whistles for you to prepare your meals if you feel the desire too! Of course you are less than a 5 minute walk from the restaurants of the "Quinta� better known as 5th avenue! Here you have restaurants of category from the most expensive to very affordable! There is a Nespresso coffee machine in the condo or you can go down the street to Ah Cacao for your lattes! What I like the most is the fact that Calle 38 is in my mind the most beautiful street in Playa Del Carmen, it takes you right down to the Shangri-La beach! The other thing I like about this condo is the fact there are 2 swimming pools On 20 feet from the front door and one roof top pool as well! It has everything and it is very relaxing and quiet and outside of the very noisy bizzy club centre very the noise from the bands can be heard till 6'in the morning. Also we are close to the grocery stores on 30 norte where you find the big stores of Mega, Walmart and Soriana! Not to mention the beautiful Private garden very zen and relaxing that this condo has! A beautiful gem in the heart of Playa! The property is beatiful and comfortable. It is very centrally located. Carla was wonderful and very informative. Carla worked with us for the chef, massages, etc gave the trip an extra special touch. My friends were amazed by it all, when really, she made it quite simple for me.. Everyone was very responsive and professional. I will certainly recommend this company and community to friends. Incredible! Beautiful rooftop views. Amazing property. Allan and Matthew are truly friendly and caring and give you every help needed. And their stuff is problem free. Carla came by our unit to offer her services. She was extremely kind and very informed, but we had secured our plans already. We loved the location!! just north of all the hustle of PDC and 5th Ave, but close enough to walk to wonderful restaurants and shops. We particularly loved the restaurant (Canabal) next to the condos for lunch because we could walk there from the beach club. The unit we stayed in has an awesome view of the beach and beautiful light all day. Overall we liked it (beds were very comfortable), although the other furnishings were not as comfortable and there were not enough shelving/furnitures spaces to put our own items (the few furniture surfaces ,other than the dining table, were filled with the owner's decorative items). Very good experience with the management company. Nice people. We had a very nice time. Great proximity to the beach, and short drive to supermarkets and other essentials. The house itself is very nice, and clean. Everything we asked for, or needed to be attended to was done promptly and professionally. Our family loved staying at Mareazul Aqua Dulce. It was the perfect place for our vacation. CARLA IS A WONDERFUL ASSET TO NORTH AMERICAN STANDARD. FRIENDLY, INFORMATIVE FREE TO TAKE OUR CALL WHEN NEEDED. SUCH A LOVELY HOME! WE COULD NOT HAVE ASKED FOR A BETTER EXPERIENCE IN PLAYA DEL CARMEN.